Congratulations go to Tim Cresner of Haymarket for claiming top spot in this year’s media industry Fantasy Football league. Amongst those sales and marketing professionals working in our industry, he’s top dog. Tim jumped from 4th to 1st in a highly unlikely scenario given he was 41 points behind the leader, Sean Buckley of WBR. Sean had been ranked high up nationally for many weeks but appeared to have two shockers right at the very end including a final GW ranking of 3,700,000. Sean captained Salah and had Aubameyang in his team but other than that there was little to speak of with an empty bench and Lingard not playing either. Tough luck Sean – you were dominant for quite a while. Tim scored 77 points in his final gameweek to place him at 419K for the game week and to finish at 49,880 nationally. Of note, he had Robertson scoring 18 points and Zaha 10, in addition to a Salah captaincy. 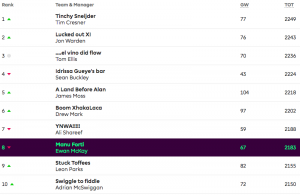 Tim had been knocking around the 100K mark for quite a while but a massive 125 point haul in DGW 37 (ranked 14,078 nationally) brought him right into contention. In the final GW Tim brought in Ayew for Vardy. I bet you were rueing that decision for a while there Tim! Regardless, you’ve won this one. Tim’s victory was a close one, beating Jon Warden of Haymarket by just six points. Jon also had a strong final GW with 76. However, had he played Zaha instead of Milivojevic then he’d be 7 points better off and would have won. Instead, Zaha’s 10 points sat on the bench. That must have been a tough call to decide who to play. Tom Ellis of UNiDAYS rounds out the top 3. Tom was ranked highly for ages and placed up to 18,000 but just couldn’t sustain it to the end. Good try Tom. For my part, I wanted a top 100K finish but a disastrous DGW 37 meant it was pretty much out of reach. Cue a 12 point hit for GW 38 most of which worked out but I still dropped quite a few places. This game gets tougher every year. Here’s the final Top 10 at the end of the season. Tim, I’ll be in touch to arrange your prize. Congratulations.